I love to cook. I don’t often have the time to try new recipes or make some of my more complicated favorites, though; other duties interfere and most nights I end up making quick and simple dishes. Which is fine, but I welcome the holidays as a time to cook a bit more elaborate fare. One of the things about being a cook is that you need people to eat your food. So naturally, Thanksgiving is one of my favorite holidays. What’s not to love? Good food, time to cook it in, and people eager to eat what you’ve made for them, I tend to be pretty traditional when it comes to my Thanksgiving menu – no deep-fried turkeys for me, thanks – but I like to mix it up occasionally with the side dishes. I’m thinking of making brussel sprouts this year, and I’m looking for a good dessert recipe. I made pumpkin cheesecake every year for years, and while it’s delicious, it’s also pretty heavy after a big meal. I’ve experimented with some lighter desserts but haven’t settled on one that I love. Maybe I’ll go back to plain old pumpkin pie; it’s not exciting but it is yummy. What about you – do you enjoy cooking as a hobby, or do you prefer to be the taste-tester and stay out of the kitchen entirely? Do you have any favorite Thanksgiving recipes? 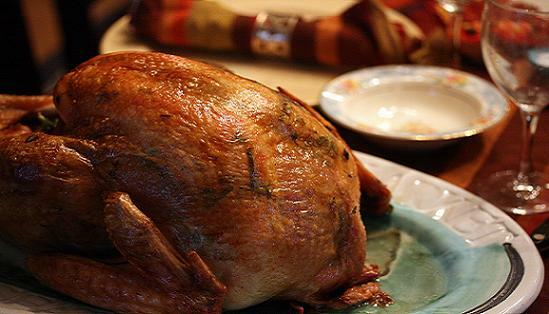 Is your family traditional or adventurous when it comes to your Thanksgiving menu? Please share in the comments! 'Tis The Season...For Sharing Recipes! I am so looking forward to this Thanksgiving. I have been missing my sister and will get to see her and my bil then. I have been eating the same Thanksgiving dinner as long as I can remember. My mother doesn’t want anyone to help w/the cooking, this is her thing. I used to drive myself nuts trying to take some of the load off of her before I realized she liked it that way. It was only a couple of years ago, when I saw the look on her face when I said “at least let me make the pumpkin pies”. I realized that was where she liked to shine. She’s great at it. I used to bring these great bakery buns until the place closed. My bil makes a broccoli salad and my sister added cornbread stuffing to the menu many years ago. It’s soo good. My mom is the one who makes it, 🙂 in addition to the traditional one she always made. That’s my dad’s favorite. Nancy, pumpkin cheesecake sounds delicious. Even if it’s too heavy after the meal, I bet it’s good the next day after a turkey sandwich, or for breakfast w/coffee. That’s one way I really enjoy coffee w/a yummy piece of cheesecake. My mother makes a killer apple cake. It’s great the day after too. I will get the recipe. I’m doing pumpkin cheesecake this year! I usually make pumpkin rolls- but its a real pain and I just don’t want to this year- I don’t want to deal with the will they/won’t they crack issue. They are delicious though so maybe I’ll share the recipe here- gotta dig it out first! Do you mean like bread rolls, or jellyroll type rolls? I have not been allowed to make jellyroll-style cakes for a number of years now because it was decreed that I got too upset when the cake fell apart as I tried to roll it up. It’s true that I used to get rather stressed over my baking disasters. The jelly roll kind. It is annoying when they crack- I dont want to be bothered this year. You’ve been banned- thats too funny! I feel your pain. Okay Ladies I need you to bring it on!!!! Just me and hubby for Turkey Day this year so I want to kick it up a bit with a new recipe 🙂 Hubby is not a dessert eater but a new stuffing idea of vegtable dish would be so appreciated! BTW I am making my dinner on Sunday since I open on Black Friday at 4 am. I can take absolutely no credit for this recipe, but I love it and it wins raves every year. Doesn’t hurt that it is quick and easy to make. I know that everyone hates brussels sprouts (I did too), but either this or plain old roasted brussels sprouts are delicious. I usually bring a sweet potato soufle with a yummy candy pecan topping. Our Thanksgiving may be different this year. My sister usually hosts since she has a big old home, but her kitchen is being remodelled and won’t be finished in time. 🙁 We are looking for an alternate plan. I could make everything myself, but no one in my little family wants to clean up afterwards. Jennie, there is usually a fruit salad at our dessert table on Thanksgiving for those who don’t want anything too heavy. There is always traditional pumpkin pie with homemade whipped cream and apple pie. Other desserts make their appearances depending on what the baker feels like making. Diane we don’t do cornbread stuffing (we’re Pennsylvanians) but our southern in-laws really miss it when they are celebrating with us. Have you ever tried that? Ina Garten on Food TV just had a show about Thanksgiving for 2. I thought the cornish hen idea was pretty good. I don’t know if I can get the recipe for the apple cake in time. But this is my favorite cheesecake recipe. It’s out of a Desserts cookbook that I think I bought from a fundraiser. I’m getting ready to make a bunch of these tomorrow. They freeze well. One thing I do different, is I like to bake the crust for about 10-12 min before I put the filling in. It makes more a crisp cookie type crust. I also like to get the cream cheese almost gooey on the melt cycle in the microwave. I have accidentally learned a new smiley face. 8) The recipe above serves about 8. Speaking of casseroles, we have one that might be a Southern cousin to Ann’s recipe that features sweet potatoes with a brown sugar, butter, and nut topping that is delicious. You almost don’t need dessert, but we still have that too. Thinking about a dish for a lighter dessert option or for someone who doesn’t eat dessert brought to mind Waldorf Salad. My sister made some during a visit to my parents, and it was delicious. She included dried cranberries in hers, which would be good for Thanksgiving. The Potato Flan looks delicious. Just reading the article, this woman, Toni Hauer is serious about her mash potatoes, too. She uses Gruyer cheese and cream and several different kinds of potatoes. I can’t wait for Thanksgiving. We’ll be going to my brother and sister-in-law’s house. I’m making pumpkin pies and bringing them out. I can’t wait to just relax and enjoy my relatives. Life has become so crazy these past few months. It’ll be nice to have it slow for at least one day. I am loving some of these ideas! Not sure what I am going to do yet. So much easier when you are cooking for alot of people instead of 2. My SIL is from the south and I have had those sweet potatoes with the pecans they are delish:) But my hubby is not a sweet potatoe fan. When I lived in Wa state I remember having oyster stuffing and that was very tasty but I think I will stick to just the regular kind. I will search for the one recipe my mom made for the holidays which was a cranberry / pineapple jello salad with a cream cheese dressing that you can put on top. I am interested in knowing what time you ladies like to eat your dinner with the family? Do you like having a early meal at noon or a early afternoon at 3 pm or just the normal dinner hour? We don’t eat early, or at least not hugely early. It’s still dinner, so it’s not an afternoon meal in our house. Probably six or seven o’clock (which is still earlier than our normal dinner hour). Wow my house is smelling awesome today:) I have my turkey in the oven. I decided to make the oyster stuffing , the brussel sprouts and chestnuts , mashed potatoes, a small amount of sweet potatoes for me !!! Hubby doesn’t like sweet potatoes or pumkin pie its a texture thing for him. Football game is on what a perfect day for hubby and me 🙂 I am so thankful for being blessed with a wonderful husband and best friend today, and having a wonderful family and friends in my life. Diane, I wish I were at your house today! How was the dinner? I was hungry just reading about it. One thing I make every year for the holidays is Spinach Dip. Now I know that this is a pretty common dip now days but I personally have not tasted a Spinach Dip better than the one I make. Actually the recipe was given to me by a friend about 30 years ago. 1- 16 ounce container of sour cream, 1- 8 oz jar of Best Food mayo (sorry Samantha and Anya), 1 box of chopped frozen spinach, about 5 green onions chopped, a tablespoon or more of Dill Weed, 1 cup of finely chopped parsley, 1 packet of Knorr Leek Soup Mix ( this is a absolute must). Make sure you thaw the spinach and press all of the extra juices out and then just mix all of the above ingredients together and let set for at least an hour so that the soup mix has time to soften and mixes in well. Goes well with veggies, chips or crackers and also is great with bread. Dinner turned out perfect ! Football game made me mad:) Thank you Erin for the link to the brussel sprouts , hubby liked it alot. I even roasted the chestnuts. The good news lots of leftovers so I won’t have to cook for a few days! Diane, that sounds like a delicious dinner. Yum. I have never had oyster stuffing. Pam, I have a New Year’s party I have to bring something to and I think I will try your recipe for spinach dip. Especially, since you say it is the best. Due to travel plans for some of the eaters, we are doing our dinner on Friday this year. I’m not sure what I’m doing on Thursday. I would love to go ahead and put up the tree, but I can’t get to it yet. I will be watching the parade. I love it and no child or family member enjoys it but me and my last little one. I’m happy to have one that enjoys it with me. I need to check in w/some friends and see what there plans are or I might just lob up and relax before the holidays begin for real. The weekend will be busy once my sister gets in. Leftovers are the best part of Thanksgiving! Glad it went well, Diane. Woohoo! My sister-in-law from California just emailed me wanting that sweet potato casserole recipe I mentioned above. Pam, I’m going to make the Spinach Dip too, although with Hellmann’s…hope that won’t ruin it. I use that also. I should have just posted mayo and not a brand. Hope your dinner turns out great! I bought my ham today from Honey Baked Ham and for the first time, one of their turkeys. I will have to tell you how they are. We love Honey Baked and many of their sides also. Really the only thing that I will have to make is the dip and the dressing. I am buying my pies from Costco this year. Have I mentioned that I don’t like to cook. LOL. Really it is not that I don’t like to cook, I just never feel like I have the time to do justice to it. Pam and Mary , Best Food mayo is Hellmans. For some reason on the west coast they call it Best Food , learned that when I moved to Wa state many moons ago. Well, you learn something new every day! I tell myself when buying store brands that they are probably made in the same factories as the name brands. I guess the jingle, “Bring out the Hellmann’s and bring out the Best” is true in more ways than one. Thanks for the info, Diane. Pam, I had a Honey Baked Ham at my very small wedding reception (actually at my parents’ home) way back. It’s a family favorite. I got to sample their turkey at a New Year’s Eve party…best I remember it was good, too. Cooking is a necessary evil 🙂 ! Actually, I don’t really feel that way, but since both my sisters are more inspired cooks than I am, I usually just provide support when we’re together. Someone said on a thread somewhere on this website that they hated to plan meals. Agreed!